Auto accident (10440 Venice Boulevard), 1952. Caption slip reads: "My own time. Photographer: Sandusky. Date: 05-18. Assignment: #20 10441 Venice Boulevard. D33-34-35-36: Man behind counter is Harold Jersey, 10441 Venice Blvd. 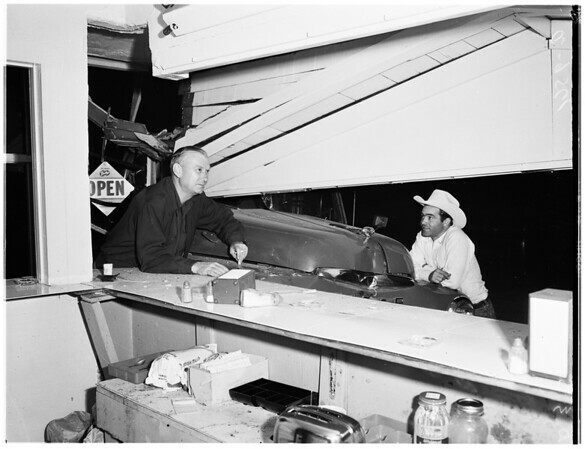 Man in cowboy hat is driver of truck, Harold B. Harrison, 25, 4124 Vinton Avenue, Culver City".